Continuity. It might not be the first thing you think about when you enter a house, but if there are no touchstones to draw your eye to, chances are you’ll notice. 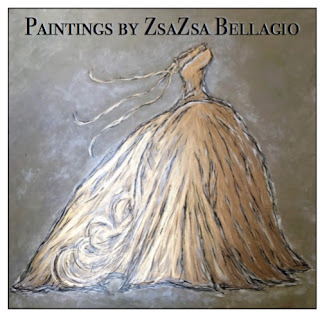 Of the myriad ways to make that connection — repeating wood finishes or establishing a geographical thread among them — the most obvious is color. 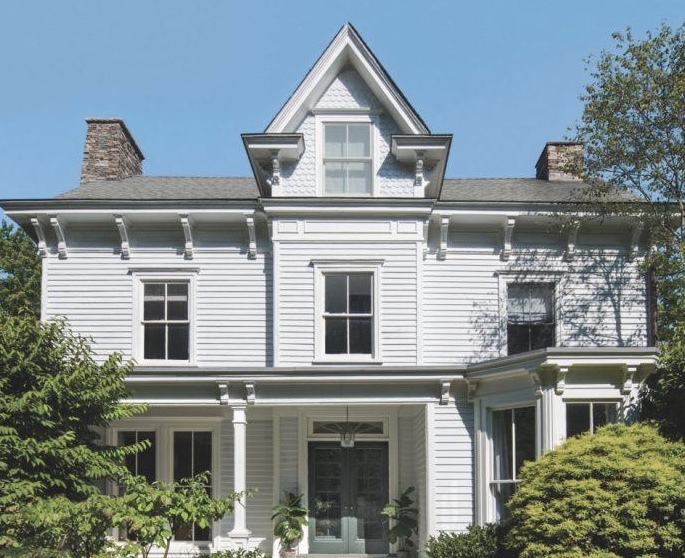 The latter is the path designer Brittany Bromley chose for the makeover of a 1860s farmhouse in Bedford, New York. 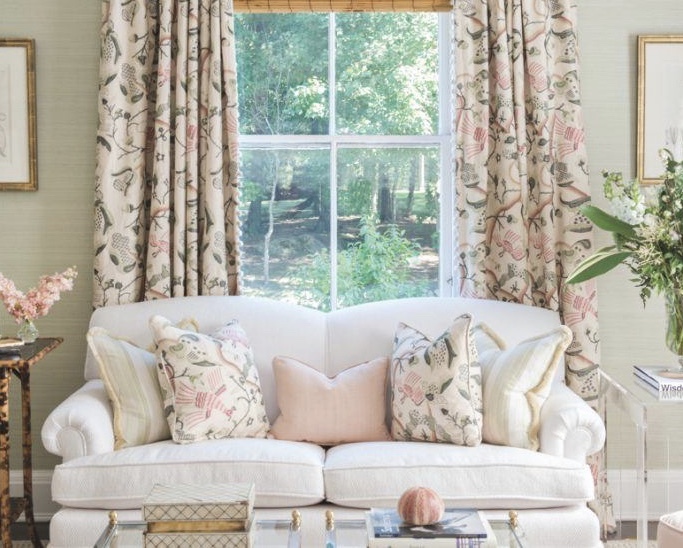 In the master suite Bromley lightened the pastels even further with the palest of celadons on the walls combined with whispers of pink, coral and cream on the furnishings and window coverings. 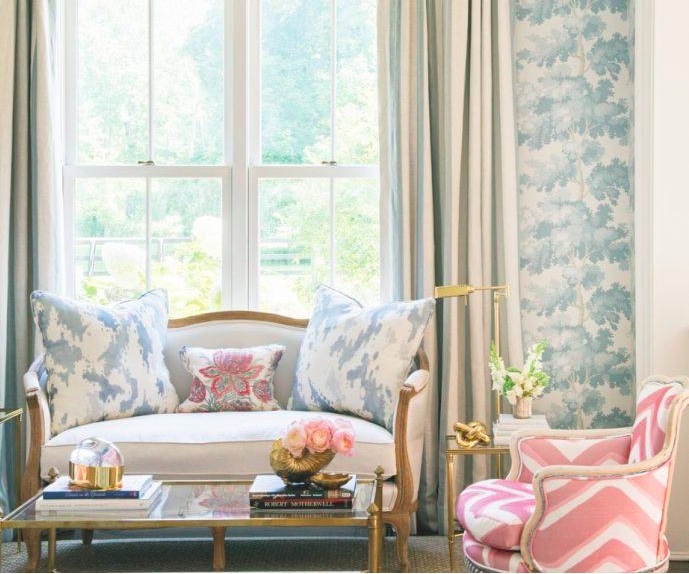 Just inside the front parlor of a home in Bedford, floral pillows made with Bennison Fabrics’ Banyan in Pink textile rest on a custom armless sofa cloaked in luxurious Claremont silk. The mirror above is from Dovecote, while the nesting table and French reading light are antiques. 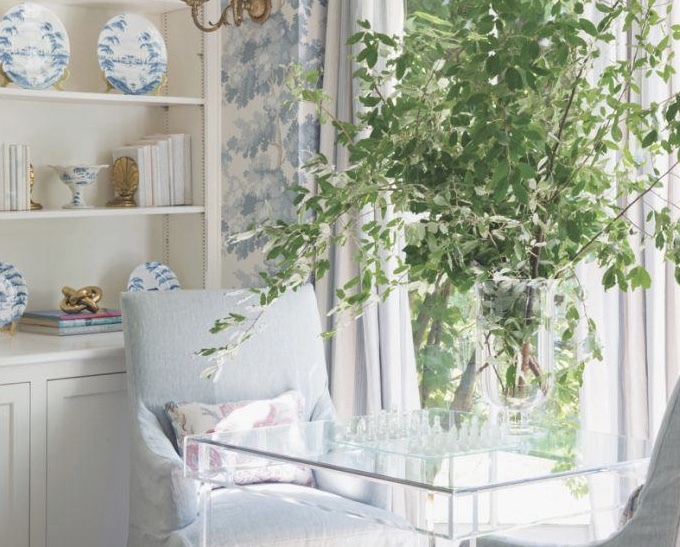 In the dining room, nature moves indoors thanks to Sandberg’s pastel tree wallpaper. 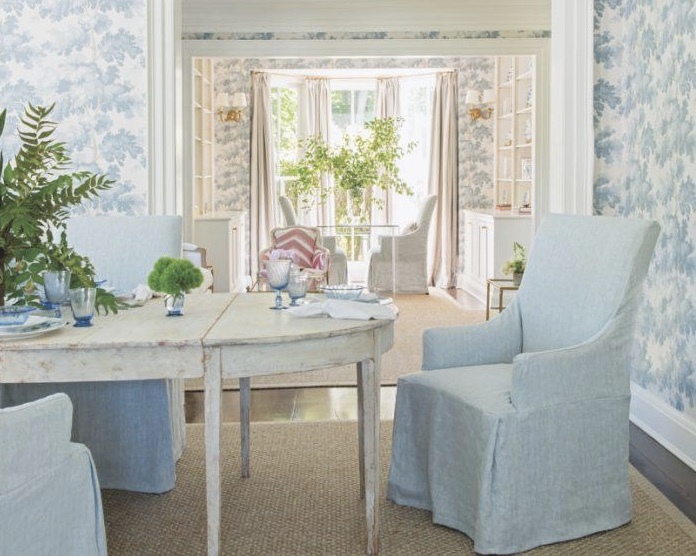 Chairs slipcovered in pale blue Elizabeth Eakins linen surround a 19th-century Gustavian Swedish table found on 1stdibs. The Merida jute rug reinforces the room’s casual-elegant theme. In the living room, French chairs clothed in Claremont silk and cashmere flank a fireplace topped with a gilt etched mirror from the Antique & Artisan Center. The English armchairs wear Robert Kime fabric, and the white Holland & Sherry sofa touts indoor-outdoor chenille. The antique Maison Bagues coffee table is from 1stdibs; the late-19th-century inlaid Syrian chest and marble-urn pilaster lamps are auction finds. A pair of Lars Bolander blown-glass light fixtures are the centerpieces in the kitchen, where a new island by woodworker Yvonne Schettino is topped with Jerusalem marble from Alise, Inc. The Roman shade is made of Christopher Farr Cloth. One portion of the parlor is reserved for games, and the Lucite table from Mecox Gardens is ready with its chess set. “For weekends in the country, everything should feel light and airy,” says designer Brittany Bromley, who extended that concept right down to the dishes. 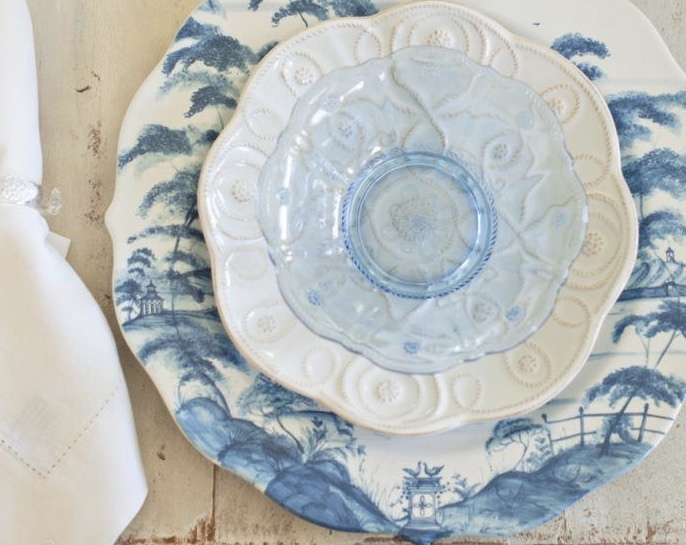 The Juliska dinnerware is among the accessories she sourced to achieve a collected feel. 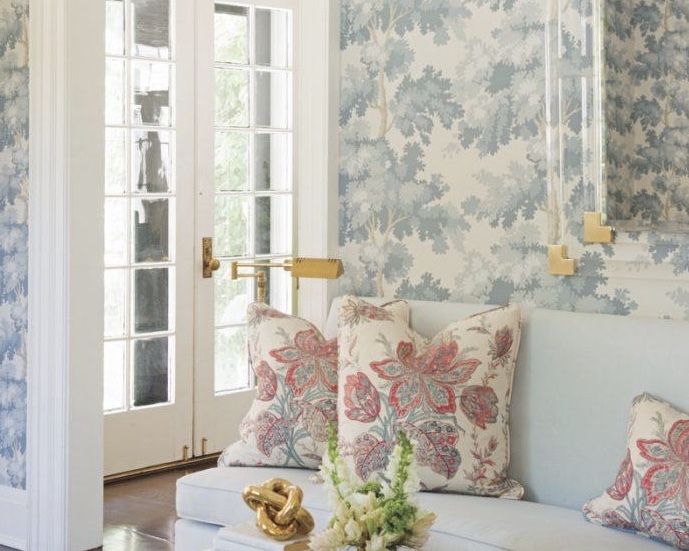 A whisper of celadon in the Phillip Jeffries wallpaper injects a sense of calm into the master suite. 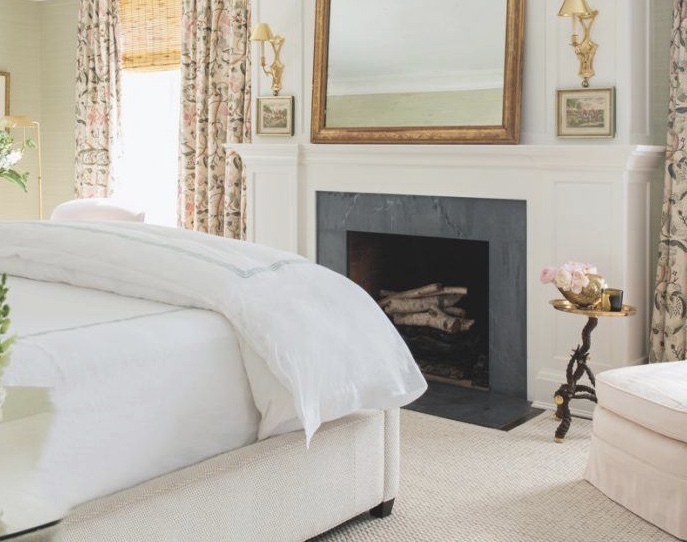 Similarly soothing is the F. Schumacher chenille bed dressed in bedding by Schweitzer Linens. 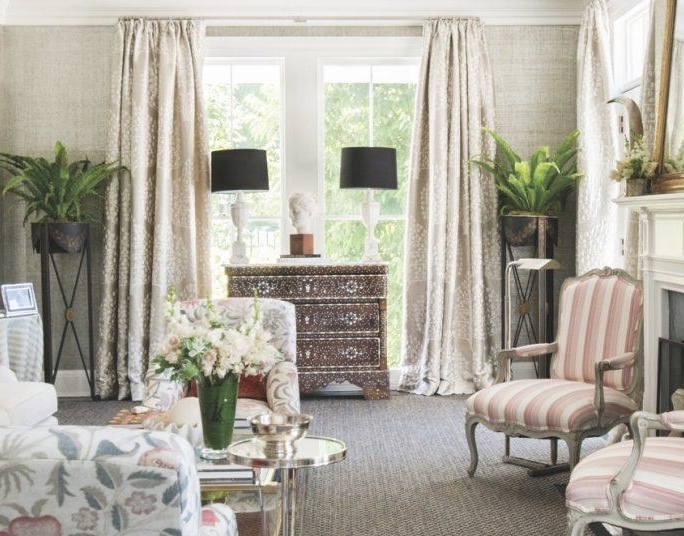 Robert Kime draperies offset an antique French chaise covered in Claremont fabric; a custom sisal-and-wool-blend Merida rug grounds the space. A George Smith sofa cloaked in Decor de Paris velveteen with an embroidered Samuel & Sons border provides comfy seating in the master bedroom sitting area. In front, a set of Maison Bagues nickel-and-brass cocktail tables from 1stdibs form a coffee table. The Lucite side table is from CB2, and the other table is an antique purchased at auction. Bromley invokes Mother Nature whenever possible and added a touch of greenery in an antique silver crew trophy on the tub deck in the master bathroom. 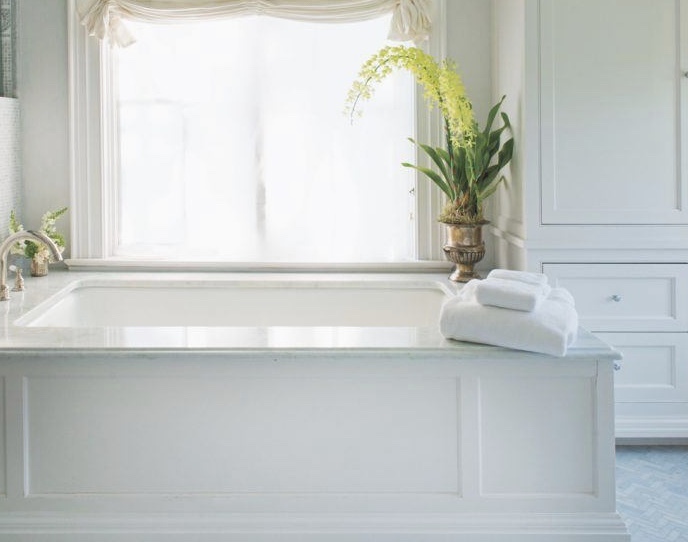 The room’s quiet palette includes a Kohler tub, a white linen Rogers & Goffigon shade and pale blue Venetian plaster walls. 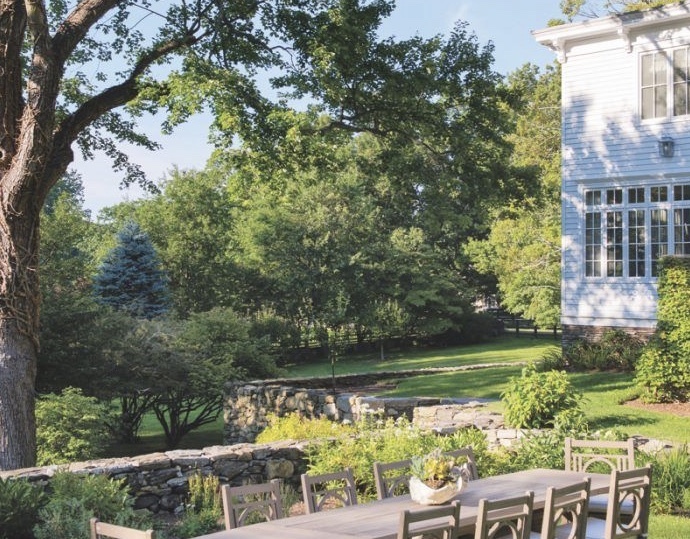 The designer, who also worked on the landscape, established an outdoor dining room amid the flowerbeds in the sunken garden. 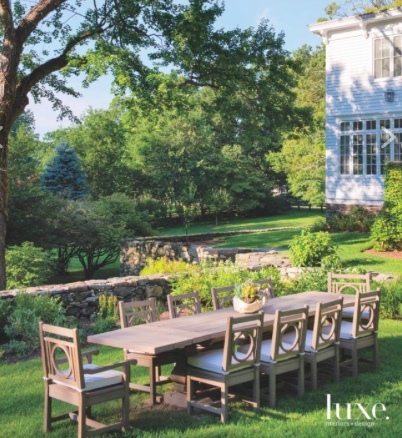 A trestle pedestal table and wood chairs, all from RH, are the perfect complement to the bucolic surroundings. The clamshell planter is from RT Facts in Kent, Connecticut. 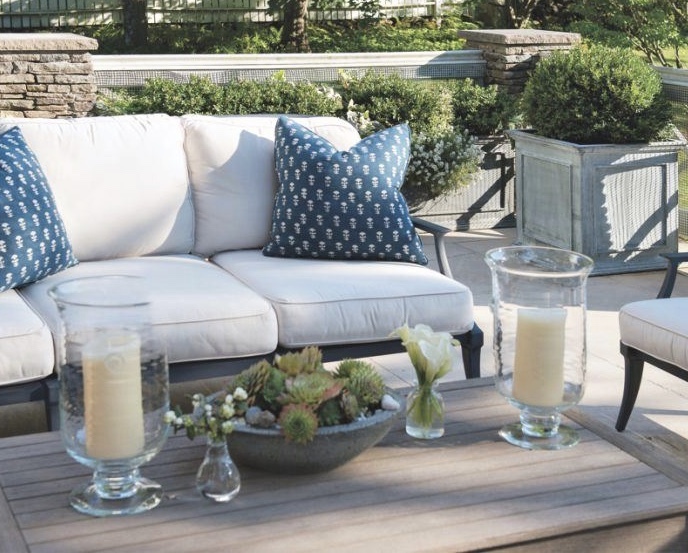 The outdoor living spaces are composed of various moments, including a zinc chair and sofa from the RH Klismos collection–featuring pillows made of Peter Dunham Textiles fabrics–facing a teak Kingsley Bate coffee table. 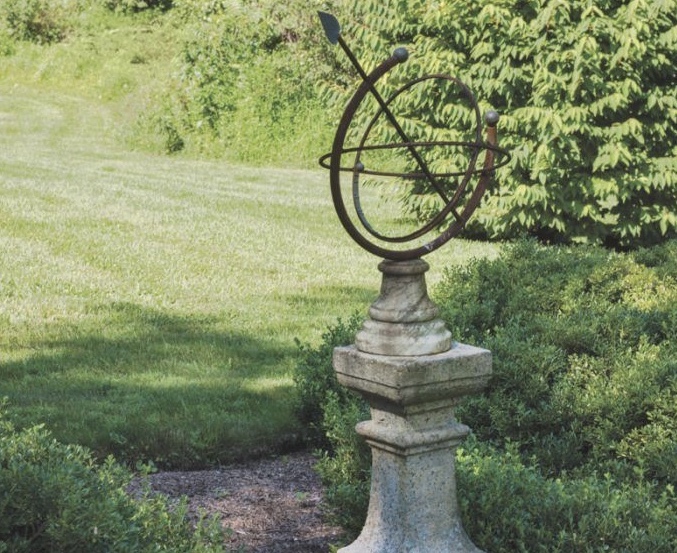 An antique sculpture makes a visual statement. 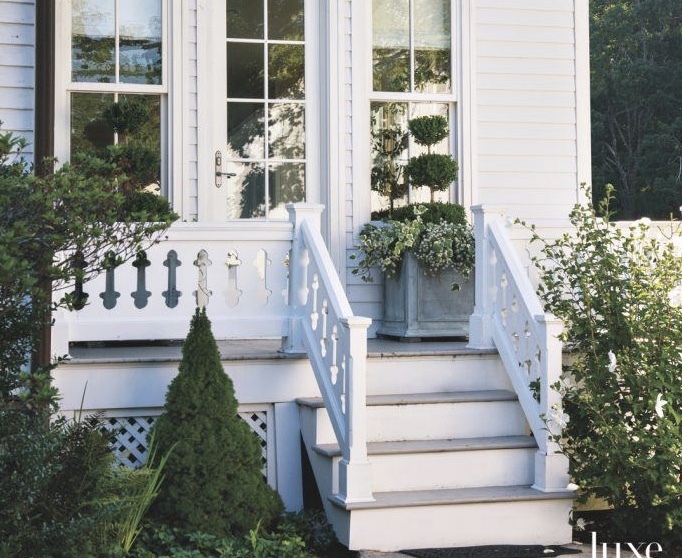 An RH planter hosting a topiary sits on the back porch. 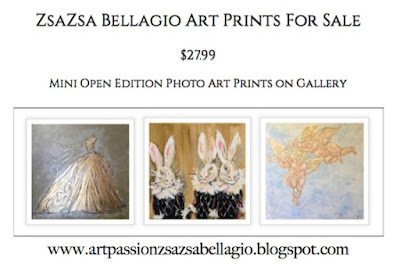 This entry was posted in flowers & garden, Home & Design, home sweet home, traditional home. Bookmark the permalink.